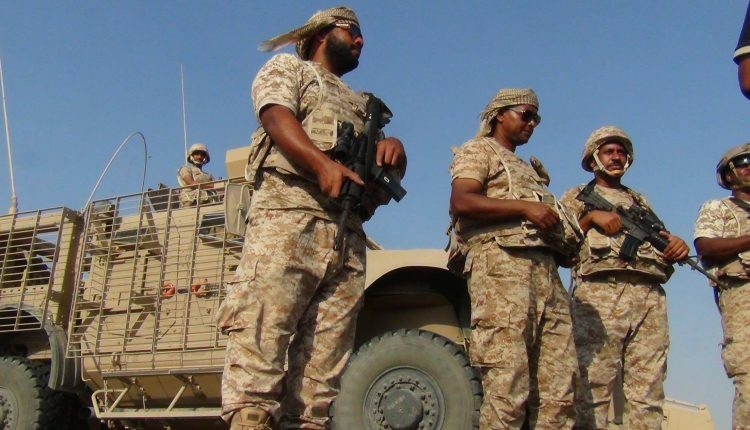 Military sources confirmed the deaths of dozens of the US-backed Saudi-led coalition on Monday, including an officer and soldiers from UAE, in clashes with the Yemeni army forces on the West Coast Front. The sources pointed out that special forces of the Yemeni army forces carried out a sudden attack on military positions and concentrations in which their enemy forces were stationed, north of the Directorate of Direhmi, in which they killed and wounded a large number of the coalition, including an officer of Mexican origin, along with others of African nationalities. According to the sources, the UAE officer who was killed, previously worked for Blackwater, before being recruited and contracted by the UAE army. International human rights organisations accused Western countries, including the United States, Britain, France and Spain, of supplying the coalition in Yemen with weapons which are being used to commit possible war crimes in Yemen. The US-backed Saudi-led coalition launched an offensive on Hudaydah on 12 June in the largest battle of the war that the United Nations fears risks triggering a famine in Yemen where an estimated 8.4 million people are on the verge of starvation. Recently, It has been paused for peace talks, but no deal has been struck leaving Yemenis pessimistic over a viable political process. Abdulmalik al-Houthi, the leader of the Houthi(Ansarallah) movement, which is the main force that faces the coallition, said on a TV speech ,” The decision of invading the Yemeni ,western coast, has been taken and adopted by the United States of America,noting that the Saudis are trying to abolish Yemen’s freedom,” stressing that it was the people of Yemen’s right to defend their country. The Bab el-Mandab Strait, which is the southern entrance to the Red Sea, is one of the world’s key shipping lanes for crude oil and allows crude exports into the European market. The United Nations said more than 350,000 people have been displaced from the strategic Red Sea port town of Hudaydah in western Yemen since June.Deputy spokesman for the Secretary-General, Farhan Haq, said during a press conference on Monday that violent clashes have erupted in the city over the past few days, especially in the Ad Durayhimi district.He added that emergency humanitarian assistance has already been provided to more than 90 per cent of those displaced. A new investigation by Associated Press has found that the coalition waging a war on Yemen has secured secret deals with al-Qaeda terrorists in the violence-wracked country, recruiting hundreds of its militants in the ground operations against the Houthi Ansarullah movement , part of the Yemeni army forces.